London: Parliament House (designs for). Unfinished design, probably for a relief sculpture, showing a large urn decorated with the lion and unicorn, surmounted by flags and a medallion with dolphins. At the base is a dedicatory panel upon which two male figures are seated, with legs crossed. You are here: CollectionsOnline / London: Parliament House (designs for). Unfinished design, probably for a relief sculpture, showing a large urn decorated with the lion and unicorn, surmounted by flags and a medallion with dolphins. At the base is a dedicatory panel upon which two male figures are seated, with legs crossed. Unfinished capriccio in black chalk of two temples and an incomplete drawing of a decorative panel. This composition and its companion in Adam vol.7/104 were intended to decorate the entrance elevation of James Adam's Parliament House scheme and can be seen behind the portico niches on either side of the door in Adam vol.28/2. The design was based on the classical trophy, examples of which can be found in Adam vol.7/71 and in Adam volume 26, which contains James Adam's collection of drawings after the antique. The inscription on the panel probably relates to the various battle reliefs by Antonio Zucchi (1726-95) found in Adam volume 7 (see Adam vol.7/47-59). Such a sculptural group was probably in James Adam's mind when he wrote in his unfinished essay on architectural theory of 1762 that ' . . . in niches are introduced statues also which, being nearer the eye, must not be very colossal. . .' (see J. Fleming, Robert Adam and His Circle in Edinburgh & Rome, London, 1962, p.318). 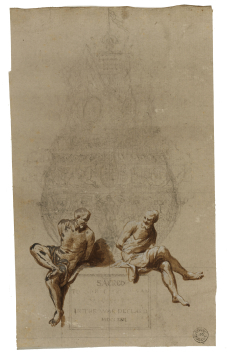 The two figures here are certainly in Zucchi's hand, although the rather tentative pencil drawing elsewhere may not be his.